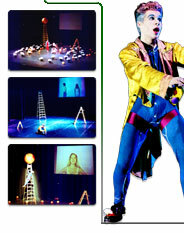 BIRTHMARKS, written by Christopher Eaves, premiered at Towson University, Baltimore, Maryland on October 14, 1991. An interdisciplinary play on adoption in America, BIRTHMARKS stars "Duckie," a tightrope walker who is dismissed from the circus after he misplaces his high-wire walking wings. 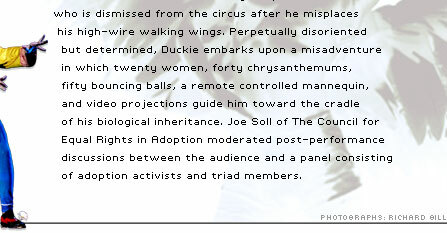 Perpetually disoriented but determined, Duckie embarks upon a misadventure in which twenty women, forty chrysanthemums, fifty bouncing balls, a remote controlled mannequin, and video projections guide him toward the cradle of his biological inheritance. Joe Soll of The Council for Equal Rights in Adoption moderated post-performance discussions between the audience and a panel consisting of adoption activists and triad members.